A Sisterhood of Service Impacting the Community. Welcome to the Virtual home of the Zeta Nu Sigma Chapter of Sigma Gamma Rho Sorority, Incoproated. "You have to act as if it were possible to radically transform the world. And you have to do it all the time." - Angela Davis. 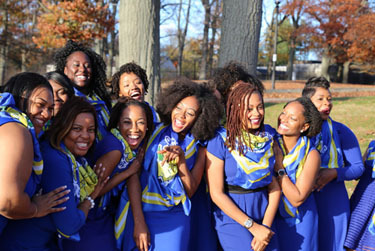 As the first alumnae chapter of Sigma Gamma Rho Sorority, Incorporated in New England, Zeta Nu Sigma Chapter has a long history of working within the Boston community providing service. We invite you to take a look at our history, events and resourses. Feel free to keep in toch by following us on Twitter, Facebook and Instagram. Our sign up for our mailing list below to get up to date information on our events.